Canada’s Patrick Cote was unable to stop the Anderson Silva juggernaut at UFC 90. Silva retained the UFC middleweight title when Cote succumbed to a knee injury in Round 3. Fans weren’t too intrigued by the main event, as the pay-per-view did only 300,000 buys. That was below average for an Anderson Silva fight. In the co-main event, Thiago Alves earned a shot at Georges St-Pierre’s UFC welterweight title with a unanimous decision over Josh Koscheck. Gray Maynard remained undefeated with a unanimous decision win over Rich Clementi in the lightweight division. Junior dos Santos made a strong debut in the Octagon, knocking out Fabricio Werdum in 80 seconds. Both men would go on to win the UFC heavyweight title. In the PPV opener, “The Muscle Shark” Sean Sherk rebounded from his loss to BJ Penn by defeating Tyson Griffin by unanimous decision. Also in the lightweight division, Spencer “The King” Fisher beat Shannon Gugerty with a triangle choke in Round 3. Thales Leites beat Drew McFedries with a rear naked choke in 78 seconds on the pre-show. The other preliminary fights all resulted in unanimous decisions. 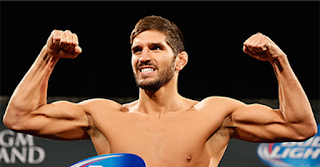 Dan Miller beat Matt Horwich; Hermes Franca defeated Marcus Aurelio; and Pete Sell beat Josh Burkman.